A group of Russian traders who found themselves shipwrecked on an Alaskan island in winter more than 200 years ago are no longer just figures in local lore. This summer, archaeologists discovered the site where the marooned survivors made camp and endured a month of subarctic winter before being rescued — the first physical evidence of their ordeal. In January 1813, a Russian frigate called the Neva foundered on the rocks off Kruzof Island in southern Alaska, while on a mission to bring colonists, workers, and supplies from the Russian port of Okhotsk to the town of Sitka. Nearly two-thirds of the ship’s passengers perished, either during the three-month crossing or in the wreck itself. But the remaining 28 survivors made their way ashore, scavenging for food, cobbling together shelter, and salvaging what they could from the flotsam of the wreck. No official documents of the incident exist, and few oral histories survive, so the new discovery made by archaeologists is providing the first concrete evidence of an episode that has been surrounded in the haze of legend. “One goal of the research is to replace some of the myths and ‘lore of the sea’ with scientific findings,” said Dave McMahan of the Sitka Historical Society, who led the research, in a press statement. 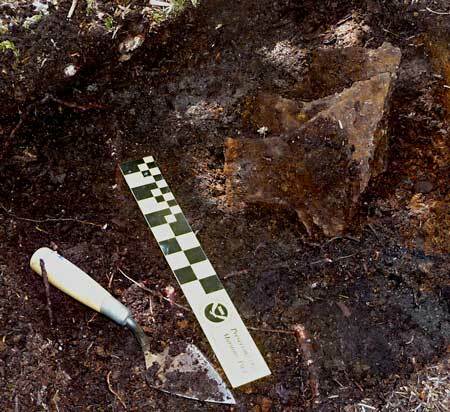 The find began to unfold in 2012, when McMahan and colleagues from the U.S. Forest Service and the Alaska Office of History and Archaeology began surveying an area near the coast of one of the islands where, based on what few clues were available, they thought the storied camp may have been located. “We did some beach survey, and then we went in the uplands, and we found caches of Russian axes where we predicted the survivor camp should be,” McMahan said. Test excavations in the area turned up charcoal hearths, where fires had been built, and nine axes of Russian manufacture, “stacked as if they’d been in a crate,” McMahan said. Returning this summer, the team began digging more test pits and found a host of materials that indicate the Russian traders used what was left of their equipment to rig together tools for their survival. 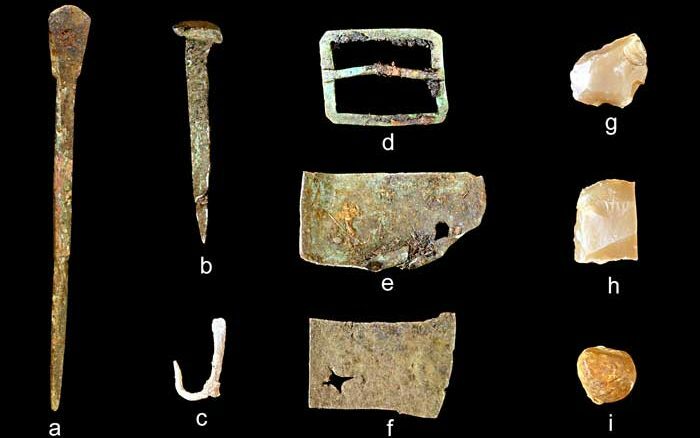 Among the finds are ersatz fish hooks fashioned from spare bits of copper, musket flints that were used to start fires, a set of compass-like tools called dividers that were used by the ship’s navigator, and musket balls that had been filed down in an attempt to make them fit firearms of a smaller caliber. 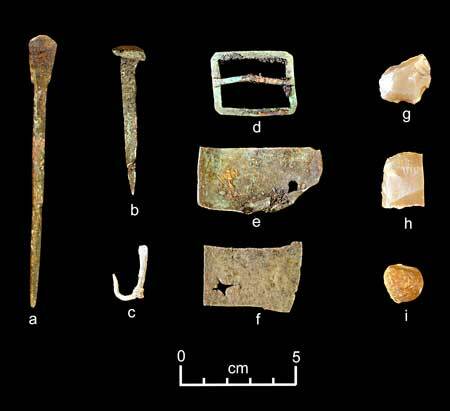 While these artifacts are intriguing in their own right, what’s equally significant are the ones that have not been found, McMahan said — namely, those that would indicate that the area was actually a habitation site, and not a temporary camp. “Collectively, the artifacts reflect improvisation in a survival situation and do not include ceramics, glass, and other materials that would be associated with a settlement,” McMahan said. No human remains were found, but it is known that two of the Neva’s passengers who made it ashore did not survive. The vessel was manufactured in Britain and originally served as a merchant ship called the Thames. After being bought by a Russian trader, it was sent to Sitka under the aegis of a Russian trade company, first to help secure Sitka, and then to colonize it. In August 1812, it set sail with 75 passengers and cargo including firearms and furs. Fifteen passengers died in the treacherous three-month voyage, which was plagued with disease and a shortage of drinking water. Its passengers weakened and its rigging damaged by storms, the Neva limped into Prince William Sound, where the crew decided to press on to Sitka. What happened between the day of the wreck and the day when rescuers took the 26 remaining survivors to Sitka nearly four weeks later is what McMahan and his colleagues are trying to determine. The archaeologists plan on returning to the camp site again next summer to search for more clues to the survivors’ story, as well as for the wreck of the Neva itself, which has never been found.